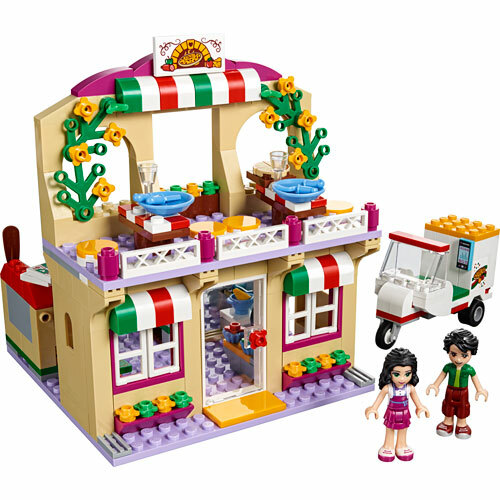 Bake and serve delicious fresh pizza with Emma and Oliver at the popular Heartlake Pizzeria. Get busy making all the orders in the kitchen and use the paddle to place them in the pizza oven. Then take them upstairs to serve them on the romantic restaurant balcony. Oliver has some orders for delivery, so jump on the scooter and deliver them across Heartlake City. 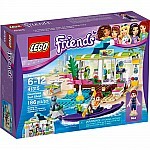 - Includes Emma and Oliver mini-doll figures. - Features a two-story Pizzeria building and a delivery scooter. - The Pizzeria building features a downstairs kitchen with opening door and windows, a pizza oven, worktop, sink, hob, cash register and plant stand, plus an upstairs restaurant balcony with tables and stools. 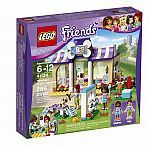 - Kitchen accessory elements include a pizza base, three pizzas with different toppings, pizza slice, pizza paddle, frying pan, cheese grater, bowl, hand whisk, rolling pin, food container, sauce bottle, and tomato and basil plants. - Restaurant accessory elements include plates, glasses, mobile phone, cash register and a bill. - Prepare pizzas in the restaurant kitchen and use the paddle to place them in the pizza oven. - Take orders for delivery over the phone, then jump on the scooter to deliver them. - Help Emma serve fresh pizza to customers on the restaurant balcony. 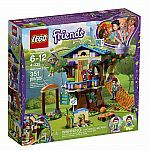 - This set offers an age-appropriate build and play experience for ages 5-12. - Pizzeria building measures over 5" (15cm) high, 4" (12cm) wide and 4" (12cm) deep. - Delivery scooter measures over 1" (5cm) high, 2" (7cm) long and 1" (3cm) wide. Measures approximately: 11.00 x 2.50 x 10.50 inches..